J. Monnier (University of Toulouse - INSA, Mathematics Institute of Toulouse, France) in collaboration with Dr J. Zhu (1 year contract CNES). This research project aims at improving the estimation of the bed topography beneath the ice-sheets (Antarctica, Greenland) where very few airborne measurements only are available. The knowledge of the bed topography is a basic step in setting up numerical flow models; moreover, combined with the surface measurements, this provides volume-mass estimations of the ice-sheets. The inference of the bed topography can be performed by inverting the physical mass equation where the glaciers flow rapidly (ice streams at ~100 m/y and more) and where dense airborne measurements are available, e.g. from CReSIS radar dataset, see e.g. BedMachine project in Greenland [Morlighem et al. 2017]. Inferring relatively accurate estimations where very few airborne measurements are available remains challenging. The current estimations (both in Antarctica and Greenland) derive from multiple airborne ice thickness surveys plus Kriging interpolation techniques; see [Bamber et al. 2013] for Greenland with uncertainties up to ± 300m, and [Fretwell et al. 2013] for Antarctica (BedMap2 project, international dataset, map produced by British Antarctic Survey). 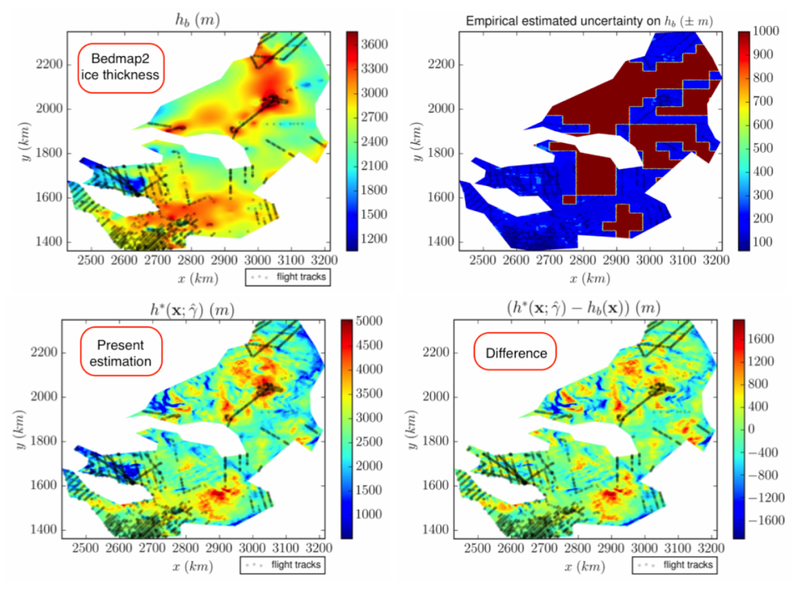 BedMap2 presents uncertainties of hundreds of meters in areas that are more than 50 km from direct ice-thickness measurements. The objective of the present project is to improve these bed topography estimations in interior sectors, where the current uncertainties are large (hundreds of meters). The inversions are based on a complete physical based model (mass equation plus momentum equations) with assimilation of altimetry data (surface elevation), InSAR data (surface velocities) and the airborne thickness measurements. A key difficulty is to separate the effects of the bed, from the basal friction (sliding amount) and the varying vertical ice viscosity (due to the temperature gradient), given their surface signatures only (that is the satellites observations). To solve this "source separation" problem, a reduced uncertainty formulation of a classical shallow ice flow model is derived, combined with state-of-the-art know-hows in Variational Data Assimilation (VDA). The resulting inferences are valid at large scale only (~30 km long) but in the great majority of the interior sectors of the ice-sheets since the physical model corresponds to surface velocities of ~10-50+ m/y. The "first guess" (first value in the iterative optimization algorithm) is the current bed estimation that is for example BedMap2 in Antarctica. The complete method and algorithms to improve the current estimations have been developed into the computational software DassFlow [Dass]; this includes Python scripts interfacing the computational code with the international multi-satellite datasets. The last and remaining stage of the study is to evaluate uncertainty bounds of the corrected bed elevation; this is on-going. The numerical results obtained on an Antarctica portion is presented below. The considered portion is relatively small (~ 200x200 km) for a sake of readability only. The algorithms can be performed to any other portions if respecting the surface velocity range previously indicated. Figure 1. Antarctica. (Left, small) Surface velocity from CSA, JAXA and ESA, processed by the glaciology group from UC Irvine, California. (Right, Zoom) Test area with the ice thickness (in m) from Bedmap2. Uncertainty in this area indicated in [Fretwell et al. 2013] is ~ ± 150 m. Lines represent the flight tracks of the ice thickness measurements. The present method does not need airborne measurements to infer the bed elevation, even it is much more accurate if such measurements are available. Indeed the present inference greatly relies on the surface observations only, that is a combination of altimetry and InSAR measurements. As a consequence in the areas without any thickness measurement (the south-west part of the present test area), the method provides an estimation of the bed elevation, on the contrary to any interpolation method (Krigging included). The present estimation is actually robust with respect to the presence or not of airborne thickness measurements. Figure 2. (L) The ice thickness (m) inferred by the present method. (R) The difference (m) with the BedMap2 estimation. The uncertainty of these bed topography corrections have to be evaluated (last stage, on-going). J. Monnier, J. Zhu. "Inference of the bed topography in mildly sheared shallow ice flows". In preparation. J. Monnier, P.-E. des Boscs. "Inference of the Bottom Properties in Shallow Ice Approximation Models". Inverse Problems, vol. 33 (9) 2017. N. Martin, J. Monnier. "Inverse rheometry and basal properties inference for pseudo-plastic geophysical flows". European Journal of Mechanics - B/Fluids, 50, 110-126 (2015). N. Martin, J. Monnier. "Adjoint accuracy for the full-Stokes ice flow model: limits to the transmission of basal friction variability to the surface". The Cryosphere, 8, 721-741, 2014. [Dass] DassFlow computational software (Data Assimilation for Free Surface flows). Available online upon request since 2005. University of Toulouse & INSA, France.